Since 2011, the Economic Policy Institute Policy Center (EPIPC) has provided advice and technical analysis of the annual budget proposal of the Congressional Progressive Caucus (CPC). Given that this partnership started when the economy had recovered just a small fraction of the millions of jobs lost during the Great Recession, the key priority in that first budget was accelerating a full economic recovery with fiscal stimulus. Because the CPC’s advice on stimulus went unheeded by the larger Congress—and fiscal policy, starting with the 2011 Budget Control Act (BCA) actually became a strong drag on growth—a full economic recovery had not arrived by the time the CPC released any of its successive budgets. 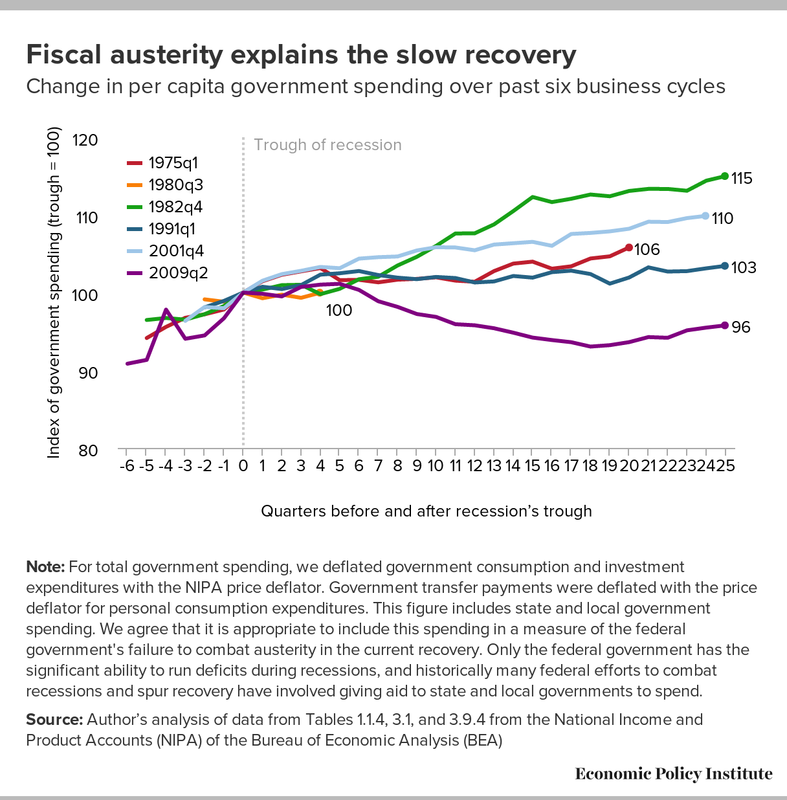 In fact, the unappreciated degree of fiscal austerity over the current recovery relative to previous recoveries fully explains the failure to reach full employment (see Figure A). This history meant that each CPC budget after the first one sensibly made creating jobs by reversing fiscal austerity a key priority. Note: For total government spending, we deflated government consumption and investment expenditures with the NIPA price deflator. Government transfer payments were deflated with the price deflator for personal consumption expenditures. This figure includes state and local government spending. We agree that it is appropriate to include this spending in a measure of the federal government's failure to combat austerity in the current recovery. Only the federal government has the significant ability to run deficits during recessions, and historically many federal efforts to combat recessions and spur recovery have involved giving aid to state and local governments to spend. This year, some signs in headline economic indicators indicate that the economy may be approaching a full recovery. It is certainly closer than it was when the CPC/EPIPC partnership began. Private-sector job growth has been positive for a record 71 straight months. The unemployment rate has fallen to 4.9 percent after reaching a peak of 10.0 percent during the Great Recession. And to slow the pace of economic growth, the Federal Reserve has begun raising short-term interest rates after eight years of keeping them at zero. 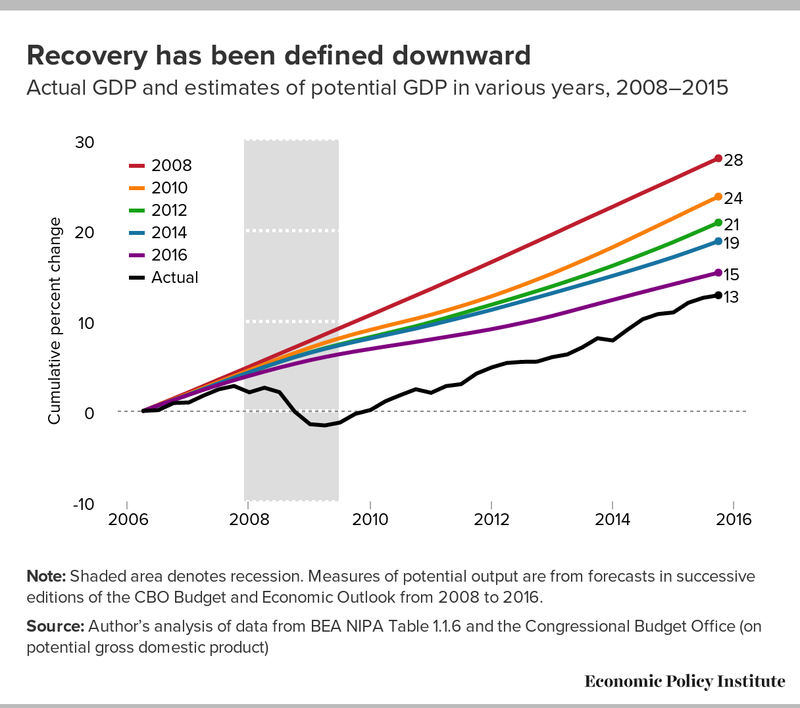 However, other indicators argue that a full recovery is not so close. Wage and price inflation remain remarkably subdued and have picked up only trivially in recent years. Given that subdued wage and price inflation essentially define slack, it is still too early to begin budgeting as if the economy is at full employment or will inevitably arrive there soon and stay there without policy help. This means that relative to other budgets the CPC’s approach of using fiscal policy to finally lock down a full recovery makes the most sense, and provides a welcome fiscal stimulus even as measures of economic slack are clearly smaller than in previous years. Further, lots of spending items in the CPC budget are worth it even in a world of full employment. In later years in the budget window, the budget’s expansions of public investments and social insurance would be paid for with progressive revenue increases. 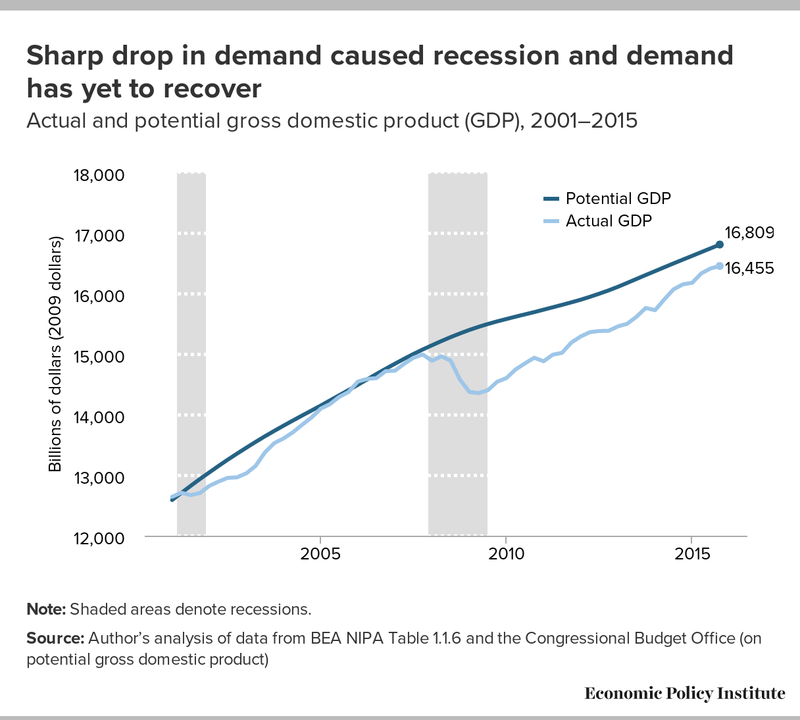 The U.S. economy has mounted a steady recovery from the Great Recession since its official end in mid-2009 but remains far enough from a full recovery to make a further fiscal boost a prudent policy choice. Conventional measures of the current “output gap”—a measure of how far from potential the economy is operating—are small, and the output gap is projected to be less than 2 percent in 2016. But the shrinking output gap over the recovery has overwhelmingly been driven by deterioration in potential output rather than by fast growth in actual output. This recent rapid deterioration of potential output is a casualty of our failure to rapidly achieve a full economic recovery from the Great Recession, as investment rates and labor-force participation rates are hamstrung by continued slack in aggregate demand. A fiscal boost, even this late in the recovery, that locks in a full recovery will halt any further deterioration of potential output caused by lagging demand and may even heal some of the previous damage. Importantly, conventional measures of the output gap assume that unemployment cannot go significantly below today’s levels for extended periods without sparking wage and price inflation. The evidence doesn’t support this presumption, and more-aggressive unemployment targets should be adopted as long as wage and price inflation remain low. It is possible that the slow recovery so damaged potential output that it cannot be repaired by a fiscal boost or that unemployment cannot go much below today’s levels. But it is far riskier to accept today’s depressed levels of productivity, wage growth, and employment rates as a “new normal” than it is to target faster growth in demand and lower unemployment. Many have posited that “secular stagnation”—a chronic shortfall of aggregate demand—has become a key feature of American economic life. If this is true, it makes the case for a more expansionary fiscal stance going forward even stronger. Recessions are periods when growth in aggregate demand for goods and services in an economy lags growth in productive capacity. When the pace of customers coming to their doors and demanding their output slows down, firms will naturally let a portion of their productive capacity—plants, equipment, and, most importantly, labor force—fall idle. (After all, why produce goods to stock your shelves if no customers are buying them?) This leads to falling output and capacity utilization and rising unemployment, all caused by the slowdown in aggregate demand growth. The economy’s productive capacity (or potential output) is assumed to grow steadily and predictably over time (or at least over short periods of time). This growth in potential output is driven by growth in the potential labor force and growth in productivity (or how much output can be produced in an average hour of work). Productivity in turn depends on the quality and quantity of capital that workers are able to use in their jobs as well as the underlying pace of technological improvements. Capital can refer either to the physical plant and equipment workers use or to human capital—the embedded education and skills workers bring to their jobs. Both physical and human capital require investments to grow over time. Aggregate demand, on the other hand, can change quite rapidly. In 2008 aggregate demand fell precipitously because the bubble in home prices began rapidly deflating. Lower home prices made households less wealthy, and they in turn cut back consumption spending. Lower home prices also made residential construction less profitable, so spending on building new homes was sharply curtailed. As households cut back on consumer purchases and businesses cut back on construction spending, unemployment began rising. Newly unemployed workers cut back their consumer spending and the businesses that supplied these consumption goods no longer had to invest to build capacity. The result of this spiral was the Great Recession—and the pattern was mostly just different in source and degree, but not in kind, from other recessions. So, as potential output grew steadily while aggregate demand plunged, a wedge (frequently called the “output gap”) opened up between the two. This output gap is the recession. Figure B shows the difference between estimates of potential gross domestic product (GDP) and actual GDP from 2000 through 2015. The large output gap that begins appearing in 2008 is clear in this graph. Normally, economies that close output gaps following a steep and long recession must see actual GDP grow well above-trend (i.e., faster than growth in potential output) for a period of time. The latest estimates from the Congressional Budget Office (CBO) indicate that the output gap peaked in 2009 at 7.1 percent of potential GDP, but has since shrunk and is projected to be less than 2 percent in 2016. However, in 2008, the year the Great Recession began, CBO projected that potential output over the next 10 years would grow at an average rate of 2.3 percent. A rapid closing of the output gap in recent years would lead one to think that actual GDP growth had been significantly more rapid than this. But it was not: actual GDP growth over the recovery has averaged just 2.1 percent per year. Given the 2008 projections for potential output, this implies that today’s output gap should be roughly 13 percent, and would barely have closed during the entire recovery from the Great Recession. But successive years have seen a rapid ratcheting down of estimates of potential output. And as of January 2016, the CBO argues that the output gap in 2016 will be less than 2 percent of GDP. Figure C shows the successive estimates of potential output since 2008 as well as actual growth in the economy since then. Note: Shaded area denotes recession. Measures of potential output are from forecasts in successive editions of the CBO Budget and Economic Outlook from 2008 to 2016. If we take the CBO estimate of potential output as given, then room for policies that will increase the pace of demand growth to restore a full recovery have shrunk significantly in recent years. To be clear, even these CBO measures do indicate some room for fiscal stimulus to provide a final burst of economic growth toward full recovery. But besides this tangible-but-limited space for fiscal stimulus in the CBO-measured output gap, there is compelling evidence that there is even more space for action to boost demand, because the demand boost could actually spill over into faster growth in potential output as well. In other words, growth in potential output and aggregate demand are not fully independent variables; in fact a prime driver of deteriorating potential output growth in recent years is precisely the continued weakness in aggregate demand. If much of the decline in potential output is driven by slack demand, then this decline is potentially reversible (at least in part) by a period of rapid growth in demand. If it is reversible, this makes it even more urgent that we undertake stimulus policies until we are positive that genuine full employment has been reached. How does weak demand eventually filter through and damage growth on the supply side? For one, about half of productivity improvements over time are the result of simple capital-deepening—the fact that business investments give workers more and better tools with which to do their jobs. For example, construction sites 30 years ago had a lot more shovels and far fewer earth-moving machines and cranes than do today’s sites. A key finding in empirical macroeconomics is that the number one determinant of business investment in plants and equipment is simply the underlying pace of economic growth.1 The falloff in business investment over the Great Recession was enormous—real, net investment in equipment and intellectual property by the private sector was negative in 2009, something that has never happened before. And business fixed investment per private-sector worker in 2009 reached its lowest level in 48 years. Given this historical collapse in investment spending, it seems fair to conjecture that American workers have less capital to work with today than they would have had, absent the Great Recession. Further, lots of business investment takes the form of research and development. And another key contributor (perhaps the single largest contributor) to productivity growth is technological advancement. This technological advancement does not fall from the sky; rather it is the product of directed investment (research and investment or R&D) and trial and error (workers learning by doing). When the pace of R&D investment is slow and output growth is slow enough to provide fewer opportunities for learning by doing, it is not shocking that technological advancement may slow. 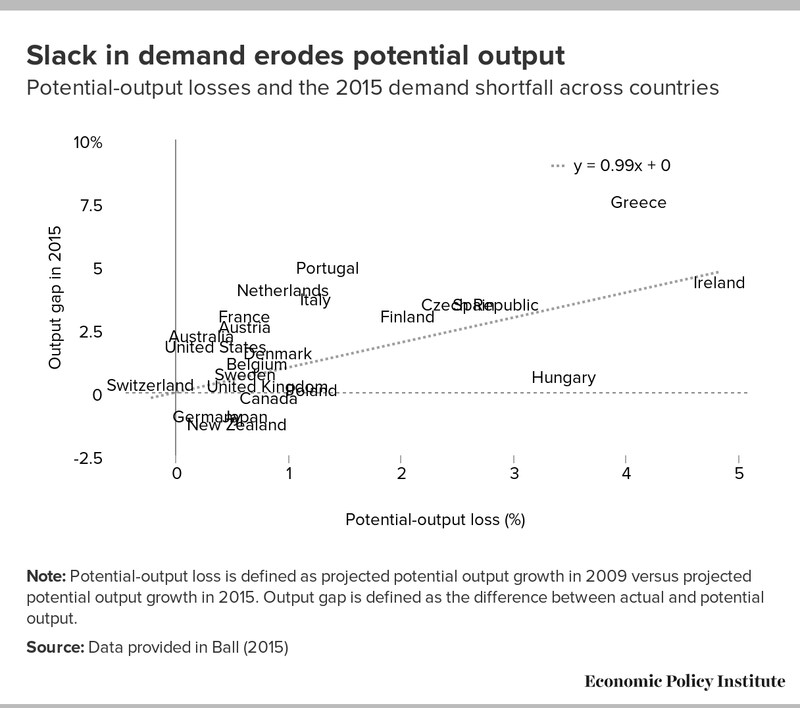 In cross-country data, the relationship between demand-driven falls in GDP and subsequent significant reductions in potential output is clear (Ball 2014). The reduction in the economy’s potential output stemming from slack demand is often referred to as “hysteresis.” In a study of 23 countries’ experience over the Great Recession and subsequent recoveries, Ball finds that “most countries have experienced strong hysteresis effects: shortfalls of actual output from pre-recession trends have reduced potential output almost one-for-one.” This strong relationship between the extent of demand slack in 2015 and the reduction in forecast potential growth rates is shown in Figure D.
Note: Potential-output loss is defined as projected potential output growth in 2009 versus projected potential output growth in 2015. Output gap is defined as the difference between actual and potential output. This finding is reinforced in recent work by Fatas and Summers (2015), who use a different methodology and replicate Ball’s finding of a one-for-one correlation between a country’s demand-driven fall in actual GDP and subsequent measures of potential output. Fatas and Summers (2015) extend this analysis to look at the relationship between potential output and a key exogenous driver of demand growth (or contraction) over the recent recovery: each country’s fiscal policy stance (measured as the change in a country’s “structural” budget balance). This provides evidence that the chain of causality does indeed run from slack demand to reductions in potential output. Their findings show a decline in potential output for every dollar of policy-induced fiscal contraction that is 1-for-1 in early years and then grows rapidly over time, leading to an almost 2-for-1 reduction in potential output. The first policy implication of hysteresis is that avoiding extended periods of demand slack and ending such periods as soon as possible is crucially important to avoid long-run scarring of the economy. This means that it is worth it to erase any remaining output gap left over by the Great Recession as soon as possible. Each month such slack persists is another month it can damage the economy’s underlying growth potential. However, hysteresis also raises the possibility that extended periods of slack should be matched by extended periods of above-average demand growth to heal damage to the economy’s productive capacity. Often hysteresis is assumed to be purely asymmetric, i.e., that slack demand can reduce potential output but increased demand can’t increase potential output, meaning very little attention is paid to the possibility that atypically rapid growth in demand growth can boost potential output. Ball (2014) however, has noted several instances in which atypically rapid growth in demand did indeed reduce estimates of the so-called NAIRU (or the non-accelerating inflation rate of unemployment), an estimate of the economy’s minimally sustainable unemployment rate. This NAIRU is a key ingredient in the overall calculation of potential output, and evidence that it can be lowered through a period of rapid demand growth strongly implies that potential output can be increased through the same method. And these periods when atypically rapid demand growth lowered the NAIRU did not, in turn, lead to unsustainable accelerations of inflation. After a one-year increase in the inflation rate associated with the demand expansion (and NAIRU reduction), further years’ inflation was not notably elevated, as shown in Figure E.
Note: The date range for each country encompasses the period in which the non-accelerating inflation rate of unemployment (NAIRU) changed, as well as the nine years following the NAIRU change. 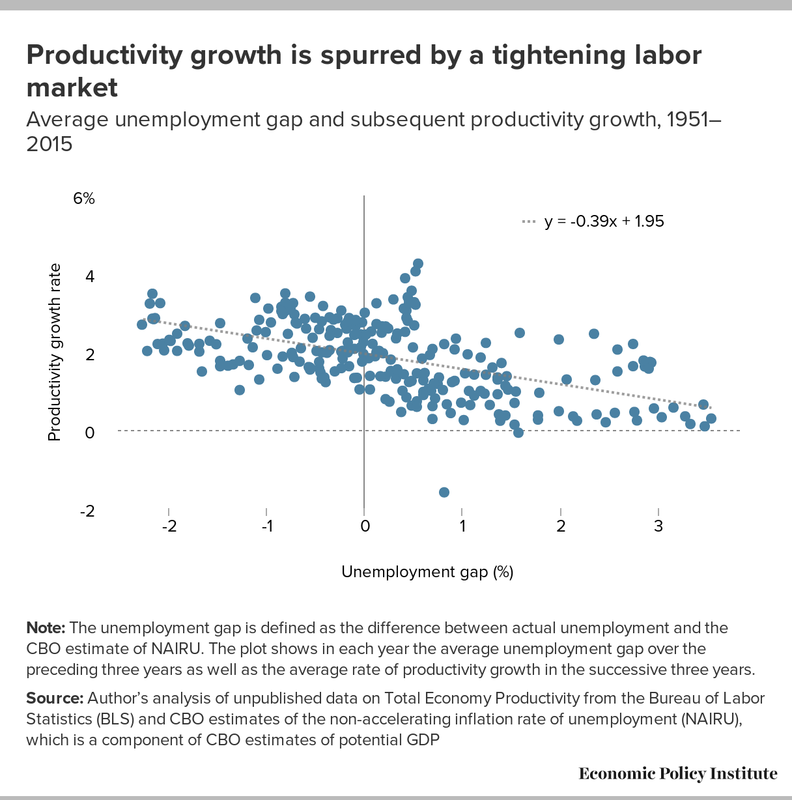 Examining the relationship between the “unemployment gap” (the difference between actual unemployment and the estimated NAIRU) and productivity shows that periods of small unemployment gaps (i.e., times of relatively tight demand) are followed by periods of above-average productivity growth and vice versa, as shown in Figure F. The gap plots the average unemployment gap over the previous three years against productivity growth in the succeeding three years. A later section of this paper highlights what could be the key link between tight labor markets and subsequently faster productivity growth: faster growth in the cost of labor could be spurring businesses to invest in labor-saving technology and capital. Note: The unemployment gap is defined as the difference between actual unemployment and the CBO estimate of NAIRU. The plot shows in each year the average unemployment gap over the preceding three years as well as the average rate of productivity growth in the successive three years. A key driver of the enhanced productivity that occurs when economic slack is reduced is increased capital investment. A long line of research highlights the tight positive link between business spending on plants, equipment, and intellectual property and the pace of overall economic growth. Figure G shows the one-year change in business fixed investment versus the one-year change in all other components of GDP. 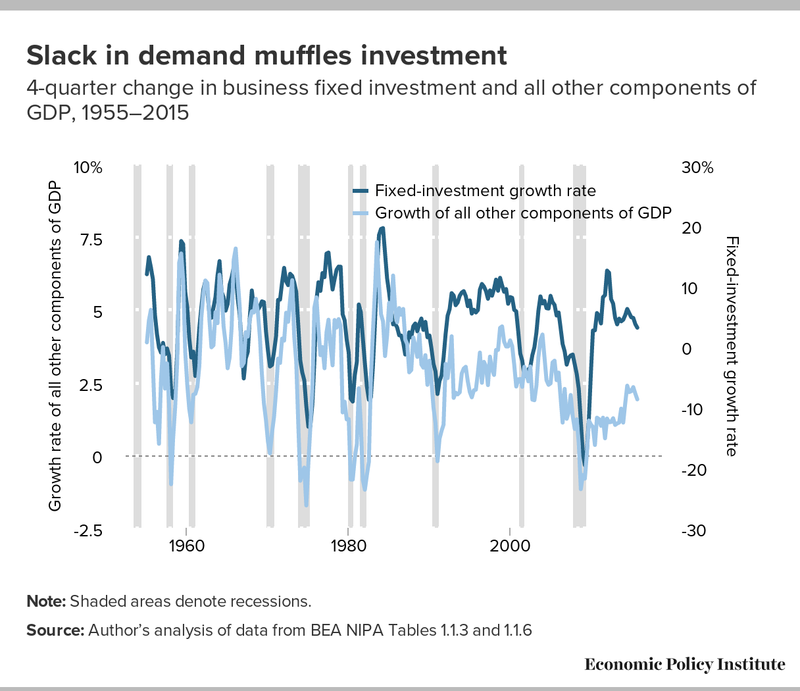 These so-called “accelerator models” of business investment work extraordinarily well in predicting investment, and they show how lagging demand in other components of GDP will depress investment spending, which should in turn drag on productivity growth. Can we still significantly reduce economic slack even when unemployment is at 4.9 percent? Estimates of today’s output gap based on projections made in 2008 are almost surely implausibly large. For example, if potential output had grown at the rate projected in 2008, the current output gap would be roughly 13 percent of GDP and would barely have closed at all. One key sign that economic slack has been reduced (i.e., that the output gap has closed) in recent years is the reduction in the headline unemployment rate, which peaked at 10 percent in 2009 and has steadily fallen to today’s 4.9 percent. Today’s level of unemployment is, in fact, in line with many estimates of the lowest unemployment rate the economy could achieve without sparking an unsustainable acceleration of inflation. For example, the CBO estimates that the NAIRU is 4.8 percent, meaning that looking solely at unemployment, the economy essentially sits at full employment today. If this was true, this would imply that further stimulus would not be able to spur growth and reduce unemployment (since the economy was essentially running at full capacity) but would instead just cause price inflation to accelerate. However, there are reasons to doubt that the full extent of economic slack is well-approximated by the difference between today’s headline unemployment rate and conventional estimates of the NAIRU. For one, we have in the not-so-distant past achieved substantially lower rates of unemployment than 4.9 percent without sparking inflation. In the late 1990s, unemployment fell rapidly below the then-contemporary estimates of the NAIRU (which were essentially 5.5 percent unemployment and above). Unemployment stayed below these NAIRU estimates for a considerable period—averaging 4.1 percent over an entire two-year period in 1999 and 2000. Yet the large acceleration of inflation never came. Instead, what came was the first across-the-board growth in real (inflation-adjusted) wages for the American workforce in nearly a generation. Since 2000 there is zero evidence that unemployment has fallen low enough to breach the inflation barrier. For example, unemployment in the pre–Great Recession business cycle (2000 to 2007) bottomed out at 4.6 percent in 2006 and 2007, yet real median wage growth was less than 0.4 percent on average over those years (see Bivens and Mishel (2015) for the data on real median wages). Currently, nominal wage growth remains far below what is needed to keep wage inflation consistent with the Fed’s 2 percent overall price inflation target. The prime reason why inflation has been so low for so long in the current recovery is that nominal wage growth has lagged far behind a reasonable target for healthy nominal wage growth. As Bivens (2014) notes, a healthy rate of nominal wage growth is simply the sum of the Fed’s inflation target and the underlying pace of economy-wide productivity growth. The intuition for this is simple: because productivity growth increases the amount of output generated in a given hour of work, increasing productivity reduces hourly labor costs per unit of output. So, productivity growth drags down (all else equal) growth in labor costs and hence prices. If this trend growth in productivity is 1.5 percent and the Fed’s inflation target is 2 percent, then nominal wages need to grow at 3.5 percent just to put keep from dragging on the Fed’s overall price inflation target. Given that the economy has been undershooting the 2 percent price target for more than five years, avoiding outright drag on this target is a far too conservative goal for wage growth. If the Fed’s price target is meant to be a medium-run average and not a hard ceiling, then the past five years of undershooting the target should be matched by an extended period of overshooting it. Further, the stunning decline in the share of output that goes to labor compensation rather than to capital incomes over the course of this recovery cannot be reversed and returned to normal levels unless nominal wage growth exceeds the sum of overall price and productivity growth for a spell. Arguing that wage growth must be firmly capped at a level that ensures zero upward pressure on the Fed’s 2 percent price target is essentially recommending that we accept today’s “new normal” of historically low labor shares of income. Recent data releases have occasionally indicated that wage growth may finally be turning up, but we are still far from seeing wage growth that is consistently high enough to actually claw back some of the damage wrought during the Great Recession. One obvious rebuttal to the analysis above regarding the proper wage target for policymakers is simply that since productivity growth has not averaged anywhere near 1.5 percent in recent years, this rate should not be used as an estimate of the underlying trend. It is true that productivity growth has been steadily decelerating over the recovery and has averaged less than 1 percent annual growth in recent years. But as noted above, some of this decline in productivity growth can simply reflect the ongoing demand shortfall. If this shortfall is finally closed we might expect some degree of productivity acceleration. One of the stronger empirically verified links between reductions in economic slack and productivity acceleration is the one driven by rising labor costs. A number of papers have found that firms boost labor-saving investments (which boost productivity) when labor costs are rising more rapidly.4 Figure H shows the relationship between the change in the labor share of income over the previous two years and the change in productivity over the succeeding two years. The positive relationship shows that larger increases in the labor share of income lead to faster productivity growth. Note: Shaded areas denote recessions. 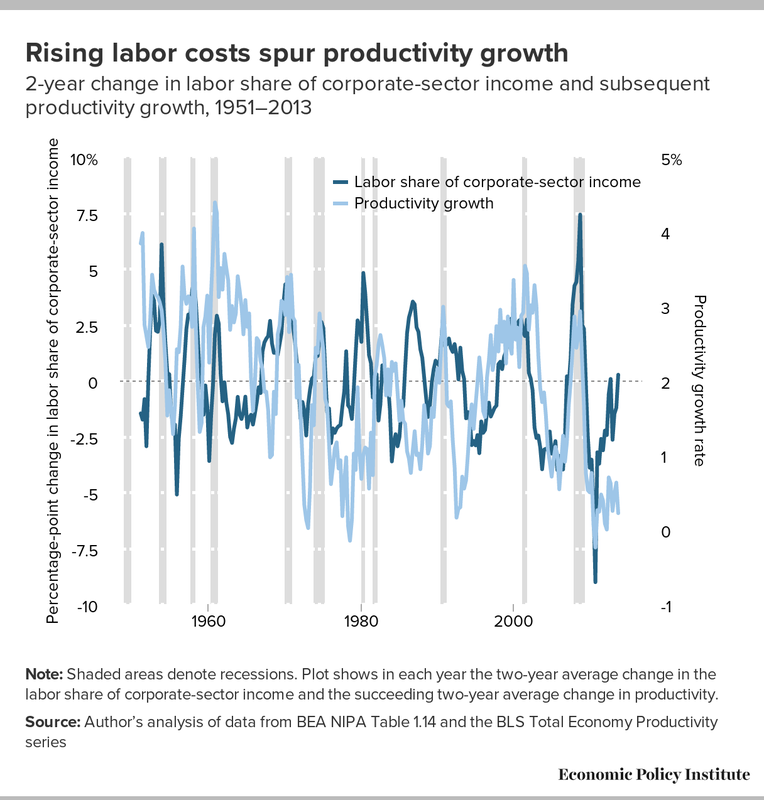 Plot shows in each year the two-year average change in the labor share of corporate-sector income and the succeeding two-year average change in productivity. Rapid labor cost growth has not been a feature of the recovery from the Great Recession. Between 2007 and 2014, real hourly pay for the median worker, for example, has slightly declined and the share of corporate-sector income accruing to capital owners rather than to employees reached historic highs. This labor market slack and weak wage growth has provided very little spur for firms to boost productivity in the search for higher profits. This provides even more reason to think that pushing the unemployment rate down even further than today’s 4.9 percent could spur both wage growth and a modest increase in productivity growth. Recent debates —particularly about analyses of Senator Bernie Sanders’ economic plans—may have created the impression that even economists who had strongly advocated increased demand stimulus during and after the Great Recession now think that the need for such stimulus has passed. This is incorrect. A measurable output gap remains and it needs stimulus to be closed in a reasonable period of time. But even more importantly, the precise size of this gap is quite uncertain, and this uncertainty leads clearly to the conclusion that it would be far better for policymakers to overestimate the additional stimulus needed than to underestimate it. The reason for this is relatively simple: monetary policy (controlled by the Federal Reserve) has proved to be a relatively weak instrument for boosting demand since 2007, mostly because of the zero lower bound on the short-term policy interest rates that the Fed traditionally lowers to spur demand. There is a useful debate to be had as to whether the Fed could have done more over the course of the recovery to spur demand, but it is clear that monetary policymakers were surely trying to boost demand between 2008 and 2015. And the measures they applied were historically unprecedented. They deserve credit for this, particularly when graded against the curve of the needless fiscal austerity that began quite soon into the recovery. But there is very little evidence that the Fed’s ability to restrain an overheating economy is compromised. There is, after all, no upper bound on how high interest rates could be raised to hold back an overheating economy. This argues that the economic cost of making fiscal policy too austere is likely far larger than making it too expansionary. The latter problem has an easy solution: monetary policy can just neutralize any excess fiscal stimulus. The former problem has no such solution: monetary policy has proved to be ineffective in countering fiscal austerity. Further, the economy has been operating below the Fed’s 2 percent inflation target for a number of years. In this context, “overshooting” on the size of fiscal stimulus (i.e., pushing the economy actually above its long-run capacity constraints for a period of time and sparking an acceleration of inflation) would not just be a low-cost, easily reversible mistake—it would not be a mistake at all. It would instead just constitute a normal part of recovery. It is worth making a wonky point here. A number of models assessing optimal policy responses to economic downturns that occur with the economy stuck at the zero lower bound on policy interest rates conclude that recovery will be much easier if policymakers can credibly commit to pushing inflation above the long-run target for a period after the recovery has begun.5 A key sticking point is how to make such a credible commitment ex ante. Following through today on a commitment to make the 2 percent price-inflation target a long-run average rather than a hard ceiling will make the jobs of future policymakers who find themselves with a depressed economy stuck at the zero lower bound much easier if it builds their credibility in this regard. The final point to make regarding risks of being over- or under-aggressive in setting fiscal policy concerns what has been labeled “secular stagnation.” There is growing evidence that the demand shortfall that has made recovery from the Great Recession so stubbornly slow could be chronic going forward. This means that to keep the economy at full employment in the future, monetary and fiscal policies may need to be more expansionary than they have been during past episodes of full employment. The causes of this chronic demand shortfall are still not entirely understood. Certainly the rise in inequality that has channeled so much money to high-income households with much lower propensities to spend is a prime suspect. And so is the policy of many countries (led by China) in recent years to actively manage the value of their exchange rates to achieve large trade surpluses (mirrored by U.S. trade deficits). Whatever the potential cause of a chronic demand shortfall, the effect is that policymakers will have to be vigilant in monitoring the demand slack in the American economy, and committed to using the tools of macroeconomic stabilization to keep the economy at full employment. In a low-interest rate, low-inflation environment, the most reliable of these tools will be fiscal policy. In truth, this likely means that the U.S. should run substantially larger deficits in the future, even at full employment. Given the ferocious downward pressure on interest rates that is the root of “secular stagnation,” the downside of larger full-employment deficits (i.e., rising interest rates that crowd out private investment) is unlikely to hold with much force. The CPC budget is actually a bit conservative in dealing with the problem of secular stagnation. Instead of locking-in larger full-employment deficits than the historical average, it pushes the federal budget deficit down in coming years. But the mix of high-multiplier spending increases and low-multiplier tax increases should still allow the fiscal policy stance to boost demand relative to current policy. To sum up we’d make the following points: We think the output gap is larger than the CBO’s estimate for 2016 (less than 2 percent), largely because of the extremely subdued wage and price inflation we see in the economy. We think the output gap is likely smaller than what would be inferred from pre-crisis trends in potential output (i.e., smaller than 13 percent). But there is a lot of room in between these two measures. Given the hugely asymmetrical risks in getting this wrong, the prudent thing to do from a policy perspective is to go big on fiscal stimulus. If the output gap is indeed quite large, then the economy will benefit greatly—both in the near term and the long term from the push to full employment and the avoidance of hysteresis. If the output gap is instead quite small and an ambitious fiscal stimulus pushes it above the long-run sustainable rates of growth (thereby nudging up inflationary pressures), then that is a good thing in the short run. In the longer run, the excess demand can be reliably reeled back in before too long by the Fed. Finally, we should note that fears about profligate fiscal policy crowding out long-term private investments do not apply to the CPC budget. The steady, upward pressure on interest rates that worries fiscal policy analysts looking at the country’s long-run debt trajectory doesn’t come from deficits today or next year, instead it comes from forward-looking financial markets looking at the trajectory of debt over the next decade. But the CPC budget puts the debt-to-GDP ratio on a downward path once full employment is reached. In short, the barriers to the CPC budget providing a needed boost to the economy in the short term and valuable public investments in the long term are clearly political, not economic. 1. See, for example, Pinto and Tevlin (2014), OECD (2015), and perhaps the earliest statement of this relationship, Samuelson (1939). 3. See Shierholz, Davis, and Kimball (2014). 4. See, for example, Marquetti (2004) and Hein and Tarassow (2008). 5. See Krugman, Dominiquez, and Rogoff (1998) or Eggertsson (2003). Ball, Lawrence. 2014. 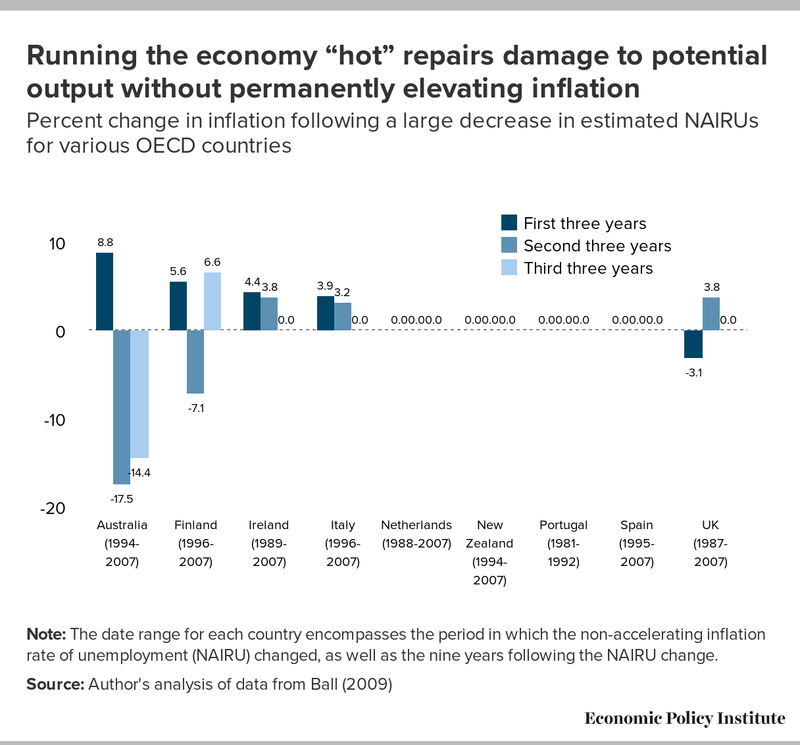 Long-term Damage from the Great Recession in OECD Countries. National Bureau of Economic Research Working Paper #20185. Ball, Lawrence. 2009. Hysteresis in Unemployment: Old and New Evidence. National Bureau of Economic Research Working Paper #14818. Bivens, Josh. 2014. Nominal Wage Targets: A Vital Dashboard Indicator for Monetary Policy. Briefing Paper for the Policy Futures Project of the Center on Budget and Policy Priorities. Bivens, Josh, and Lawrence Mishel. 2015. Understanding the Historic Divergence between Productivity and a Typical Worker’s Pay. Economic Policy Institute Briefing Paper #406. Bureau of Economic Analysis (U.S. Department of Commerce) National Income and Product Accounts. Various years. National Income and Product Accounts Tables [data tables]. Bureau of Labor Statistics (U.S. Department of Labor). Various years. Labor Productivity and Costs program. Unpublished data on total economy productivity. Washington, D.C.
Congressional Budget Office (CBO). Various years. Potential GDP and Underlying Inputs data. Eggertsson, Gauti. 2003. “Zero Bound on Interest Rates and Optimal Monetary Policy.” Brookings Papers on Economic Activity, no. 1, 139–233. Fatás, Antonio, and Lawrence Summers. 2015. The Permanent Effects of Fiscal Consolidations. Discussion Paper #10902. Centre for Economic Policy Research (CEPR). Hein, Eckhard, and Artur Tarassow. 2010. “Distribution, Aggregate Demand and Productivity Growth: Theory and Empirical Results for Six OECD Countries Based on a Post-Kaleckian Model.” Cambridge Journal of Economics, vol. 34, 727–754. Krugman, Paul, K.M. Dominiquez, and K. Rogoff. 1998. “It’s Baaack: Japan’s Slump and the Return of the Liquidity Trap.” Brookings Papers on Economic Activity, no. 2, pages 137–206. Lovenheim, Michael. 2011. “The Effect of Liquid Housing Wealth on College Enrollment. Journal of Labor Economics, vol. 29, no. 4, 741–771. Organization for Economic Co-operation and Development. 2015. OECD Economic Outlook. Pinto, Eugenio, and Stacey Tevlin. 2014.” Perspectives on the Recent Weakness in Investment.” FEDS Notes. May 21, 2014. Samuelson, Paul. 1939. “Interactions Between the Multiplier Analysis and the Principle of Acceleration.” Review of Economics and Statistics, vol (1), 1–17. Shierholz, Heidi, Alyssa Davis, and Will Kimball. 2014. The Class of 2014: The Weak Economy is Idling Too Many Young Graduates. Economic Policy Institute Briefing Paper #377.